How to set your personal goals? would not spend half of that time to plan their lives. Planning our life and careers would start by identifying our short-term and long-term goals. We should articulate the goal and then set a plan to achieve them. 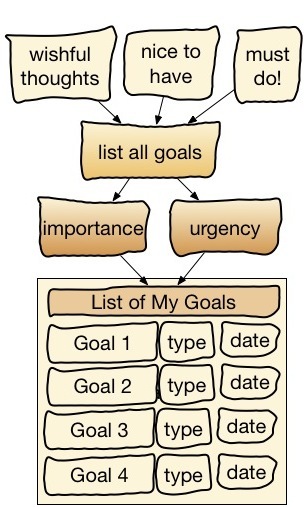 We need to select the achievable and realistic goals to improve our life. You will be able to set your personal goals and write a plan to achieve by simply reading the following text and follow the simple guidelines. Many of us had assembled a toy or a piece of furniture before. You probably did the assembly with the help of the instruction sheet or a drawing which was folded inside the box. Researchers found that many people spend long time to plan their vacation and take care of the little details to enjoy every hour of their vacation time. The same people would not spend half of that time to plan their lives. Planning our life and careers would start by identifying our short-term and long-term goals. We should articulate the goal and then set a plan to achieve them. We need to select the achievable and realistic goals to improve our life. You will be able to set your personal goals and write a plan to achieve by simply clicking on and reading the following PDF file the simple guidelines. Please click on “How to set your personal goals” to download the file. 7 Responses to How to set your personal goals? Note : Check the post Sami , I think you right the same Paragraph twice . Glad that you liked it. I hope that more people read and share to set SMART goals for themselves. Simple common sense… but rarely adopted. Thanks for this post. I tried to make it as simple as I can for every reader to understand and adapt. Very useful & smart article. Thanks for sharing! I am glad that you visit the blog and liked this article.